From a painting by Fred Pansing. 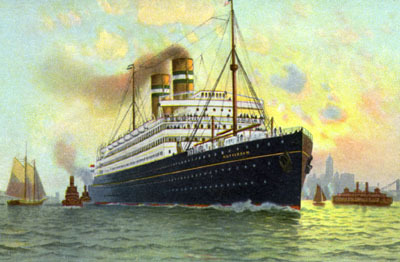 Built by Harland and Wolff, Belfast, the ROTTERDAM IV held 530 First, 555 Second and 2,124 Third Class passengers. She was a liner with two funnels, Holland America's first, 650 feet in length and 77 feet wide. Her registered tonnage was 24,170 and displacement of 37,190 tons. She traveled at an average of 16.5 knots. She was sold in January of 1940 to Dutch breakers. by H.A. Dalkmann and A.J. Schoonderbeek, Pentland Press 1998. The ROTTERDAM IV had the distinction of being one of the earlier ships of the Holland America Line used for pleasure cruising. (The first Holland America cruise was to Copenhagen on the ROTTERDAM II in June 1895 and the second Holland America cruise going to the Holy Land on the STATENDAM in 1910.) 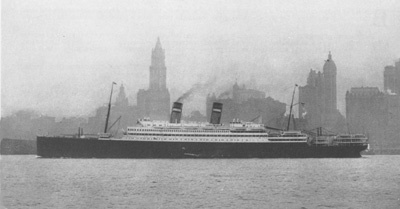 She was specially chartered for "Clark's 16th Annual Cruise to the Mediterranean and the Orient" which would begin on February 16, 1914, leaving New York. It was a tour of 64 or 70 days. The ship was advertised as "sumptuous" with 56 rooms with brass bedsteads and private baths. There were also 150 single rooms and "no overcrowding". It was first class throughout. For $400 and up, your cruise would include shore excursions, guides, fees, hotels, drives and all necessary expenses. 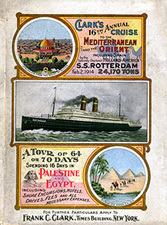 Special features included stops at Madeira, Cadiz, Seville, Athens, Constantinople, 16 days in Palestine and Egypt, and 4 days in Rome, Monte Carlo, as well as other ports of call. You had an optional week in London for $30 or Holland for $20. The S. S. "Rotterdam" (24,170 tons), of the Holland America Line, is one the finest,largest and most popular ships crossing the Atlantic and cost about $5,000,000 to build. She has become famous because of her exceptionally attractive features, so that many discriminating travelers choose her in preference to any other Atlantic steamer. In luxurious appointments, in extraordinary size of rooms,averaging much larger than on any of our ships on previous Cruises, as well as in her extreme steadiness, almost eliminating seasickness, she is unsurpassed. She has 56 suites and rooms with brass bedsteads and private baths, and over 100 single rooms, together with a beautiful Palm Court, Verandah Cafe, Elevator, Social Hall, Library, 3 Smoke Rooms, a glass enclosed Promenade Deck, electrically forced ventilation of hot and cold air, etc. Most of the outside staterooms have two, and in some cases three, windows or portholes, some being fitted with a device that admits fresh air freely, even when the porthole is closed. One of her most attractive features is an immense Dining Saloon, seating nearly 500 people at small tables, where all of our passengers will take their meals, and where an orchestra of artists of high merit will play during lunch and dinner, as well as in the Social Hall in the evening. The cuisine is strictly French and is famous among the most exacting travelers. Meals will be served a la carte (not table d'hote), passengers ordering what they like, without extra charge, from an elaborate bill of fare. The stewards and stewardesses on the "Rotterdam" speak English. Time never drags on board of the steamer on our Cruises, as the social life is enjoyable and informal to an extraordinary degree. There is a constant round of attractive features: namely, lectures, dances, concerts, progressive euchre or auction bridge and prizes, gymkana games on deck with prizes, meetings of Travelers' Clubs, of the D.A.R., Masons, Camera Club, Musical Club, etc. Services with musical features and brief sermons by prominent ministers will be held on Sundays, except when in port. The "Rotterdam" is the newest and by far the finest addition to the great modern fleet of the Holland-America Line, exceptionally steady on acount of her size and her tremendous bilge keels, and is thoroughly up-to-date in equipment. Passengers may be outdoors on the Promenade Deck under practically all weather conditions, deriving at all times the benefit of the invigorating fresh air, as this deck is partly enclosed on three sides with large widows which may be opened or closed at will. The topmost of the passenger accommodation is located on this Promenade Deck and consists of two beautifully appointed sets of rooms en suite. On the deck below, including the entire length of the deck house, are two other suites similar in appointment, and large outside cabins containing two or three berths, and nearly two score cabins arranged for the exclusive occupancy of one person. A feature of two blocks of rooms on this deck is the communicating door between the inside and the outside rooms, making them particularly desirable for the use of families or friends. On Deck "B" is an innovation in modern liners, there being virtually a whole deck of cabins each with a private bath and toilet connecting. The rooms are fitted each with brass beds and most of them, in addition, are provided with a Pullman or folding upper berth, so that they may on occasion take three persons. The "C" and "D" Decks have the usual inside and outside cabins, many of the inside cabins being arranged for the exclusive use of one person. One feature of some of the cabins on these decks and worthy of especial mention is the arrangement of the berths, where they are end to end rather than on opposite sides of the cabin, as is more usual, and in this way exceptional size is given to these rooms. Many "D" Deck cabins arranged in this manner have three large portholes; in none is there less than two. The staterooms throughout the ship are equipped in accordance with the most advanced ideas of comfort and practicability; ventilation has been carefully looked after and in many cases upper berths have been entirely eliminated. Another feature of the equipment in many of the cabins is a bureau of generous proportions with mirror and four deep drawers. View passenger photos circa 1910. Traveling in First Class. ......there are more photos with further descriptions of the interior on the connecting pages.